Each year a Christmas Party is held in Beckingham for all senior citizens over the age of 65 who are resident in Beckingham and Saundby. Originally organised by Beckingham Women’s Institute, which sadly no longer exists, it is now run by Claire Hunter with the help of volunteers who give so generously of their time. It is paid for by money from a raffle and a generous donation from the Parish Council. 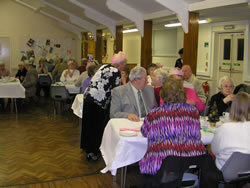 For 2008 it took place on Friday 5th December in the Village Hall at 5pm. 80 people attended who were served with a meal of ham salad, trifle, cakes, tea and coffee, along with nuts, crisps, sweets and Christmas cake. Wine, beer and soft drinks were also provided and of course everyone had a Christmas cracker. After the meal there were several games of bingo and the raffle was drawn. 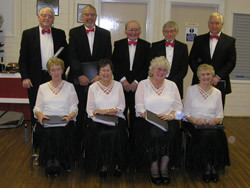 Entertainment was provided by the excellent Isle of Axeholme Songsters who sang several varied and seasonal melodies with many of the "guests" joining in. They also recited some hilarious monologues which were very much enjoyed by everyone. 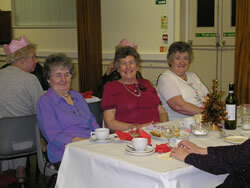 A wonderful time was had by all and much appreciation and thanks go to Claire and her cheerful volunteers.